The goal of our workshop is to provide a follow-on forum to last year’s very successful Argumentation Mining workshop at ACL, the first research forum devoted to argumentation mining in all domains of discourse. 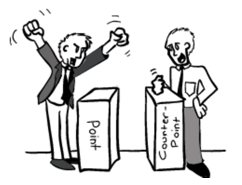 Argumentation mining is a relatively new challenge in corpus-based discourse analysis that involves automatically identifying argumentative structures within a document, e.g., the premises, conclusion, and argumentation scheme of each argument, as well as argument-subargument and argument-counterargument relationships between pairs of arguments in the document. To date, researchers have investigated methods for argumentation mining of legal documents (Mochales and Moens 2011; Bach et al. 2013; Ashley and Walker 2013; Wyner et al. 2010), on-line debates (Cabrio and Villata 2012), product reviews (Villalba and Saint-Dizier 2012; Wyner et al. 2012), user comments on proposed regulations (Park and Cardie 2014), newspaper articles and court cases (Feng and Hirst 2011). A related older strand of research (that uses the term ‘argumentative structure’ in a related but different sense than ours) has investigated automatically classifying the sentences of a scientific article’s abstract or full text in terms of their contribution of new knowledge to a field (e.g., Liakata et al. 2012, Teufel 2010, Mizuta et al. 2005). In addition, argumentation mining has ties to sentiment analysis (e.g., Somasundaran and Wiebe 2010). To date there are few corpora with annotations for argumentation mining research (Reed et al. 2008) although corpora with annotations for argument sub-components have recently become available (e.g., Park and Cardie 2014). Proposed applications of argumentation mining include improving information retrieval and information extraction as well as end-user visualization and summarization of arguments. Textual sources of interest include not only the formal writing of legal text, but also a variety of informal genres such as microtext, spoken meeting transcripts, product reviews and user comments. In instructional contexts where argumentation is a pedagogically important tool for conveying and assessing students’ command of course material, the written and diagrammed arguments of students (and the mappings between them) are educational data that can be mined for purposes of assessment and instruction (see e.g., Ong, Litman and Brusilovsky 2014). This is especially important given the wide-spread adoption of computer-supported peer review, computerized essay grading, and large-scale online courses and MOOCs. Success in argumentation mining will require interdisciplinary approaches informed by natural language processing technology, theories of semantics, pragmatics and discourse, knowledge of discourse of domains such as law and science, artificial intelligence, argumentation theory, and computational models of argumentation. In addition, it will require the creation and annotation of high-quality corpora of argumentation from different types of sources in different domains. This workshop will solicit full papers and short papers for oral and poster presentations as well as demos of argument/argumentation mining systems and tools. Argument mining and user generated content (UGC): automatic identification of argument elements in UGC, automatic identification and classification of relations between argument elements, relationships to discourse goals/rhetorical strategies in UGC, manually annotated and applications related to argument mining in UGC. Papers that describe systems or tools are also invited to give a demo of their system. If you would like to present a demo in addition to presenting the paper, please make sure to select either "full paper + demo" or "short paper + demo" under "Submission Category" in the START submission page.